^ Smith (1907), vol 1, pp. 317-324. ^ Arnold's expedition is described in detail in e.g. Smith (1903) and Desjardins (2006). ^ Rideau, Roger. A Brief History of Canada. Facts on File. pp. 79. Coffin, Victor (1896). The Province of Quebec and the Early American Revolution. University of Wisconsin Press. http://books.google.com/books?id=dLtYAAAAMAAJ. Dale, Ronald J (2003). The Invasion of Canada: Battles of the War of 1812. James Lorimer. ISBN 9781550287387. Glatthaar, Joseph T; Martin, James Kirby (2006). 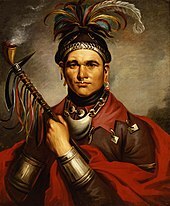 Forgotten Allies: The Oneida Indians and the American Revolution. New York: Hill and Wang. ISBN 9780809046010. OCLC 63178983. Kingsford, William (1892). The History of Canada, Volume 5. Roswell & Hutchinson. http://books.google.com/books?id=XspYAAAAMAAJ. Lossing, Benson John (1888). The Empire State: A Compendious History of the Commonwealth of New York. Funk & Wagnalls. http://books.google.com/books?id=KA2KZWfA-NYC. Morrissey, Brendan; Hook, Adam [translator] (2003). Quebec 1775: The American Invasion of Canada. Osprey Publishing. ISBN 9781841766812. Porter, Joseph Whitcomb (1877). Memoir of Col. Jonathan Eddy of Eddington, Me: With Some Account of the Eddy Family, and of the Early Settlers on Penobscot River. Sprague, Owen & Nash. http://books.google.com/books?id=KkLLxWdzeKAC. Smith, Justin H (1903). 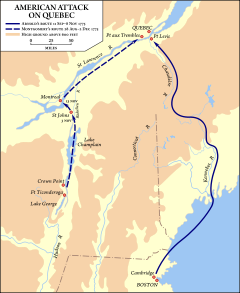 Arnold's March from Cambridge to Quebec. G. P. Putnams Sons. http://books.google.com/books?id=vlU06ifA9ZEC. This book includes a reprint of Arnold's diary of his march. Smith, Justin H (1907). Our Struggle for the Fourteenth Colony, vol 1. G.P. Putnam's Sons. http://books.google.com/books?id=Ls9BAAAAIAAJ. Smith, Justin H (1907). Our Struggle for the Fourteenth Colony, vol 2. G.P. Putnam's Sons. http://books.google.com/books?id=19VBAAAAIAAJ. Thayer, Simeon; Stone, Edwin Martin; Edwards, Morgan;Rhode Island Historical Society (1867). 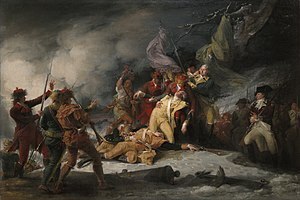 The Invasion of Canada in 1775: Including the Journal of Captain Simeon Thayer, Describing the Perils and Sufferings of the Army Under Colonel Benedict Arnold, in Its March Through the Wilderness to Quebec. Knowles, Anthony & Co.. http://books.google.com/books?id=afcLAAAAYAAJ. Royal Society of Canada (1887). Proceedings and Transactions of the Royal Society of Canada: Deliberations Et Memoires de la Societe Royale Du Canada, 1886, Series 1, Volume 4. Royal Society of Canada. http://books.google.com/books?id=tzMoAAAAMAAJ. Hatch, Robert McConnell (1979). 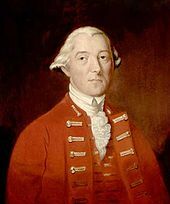 Thrust for Canada: The American Attempt on Quebec in 1775-1776. Houghton Mifflin. ISBN 0-395-27612-8. Rumilly, Robert (1970). Histoire de Montreal. Volume 2. Fides.